I find there is two kinds of recipes. There are the ones with very long ingredients lists. Those dishes usually take a long time to prepare. However, there will provide layers of flavor, either by an extended combination of veggies, grains and/or meat/fish or by a long spices/herb list. The ingredients have to be weighed carefully against each other for everyone to come out by its best. The other recipes have a very short ingredients list. You throw three or four ingredients together and there you go: food's ready. This pretty much applies to raw truffles: take one part dried fruits, one part ground nuts of your choice, a few tablespoons of your favorite sweetener and some flavoring. Process in a food processor and that's all it takes. To make them look pretty you can roll them in something powdery. What I also like is, that with these truffles there is so much space for variety. 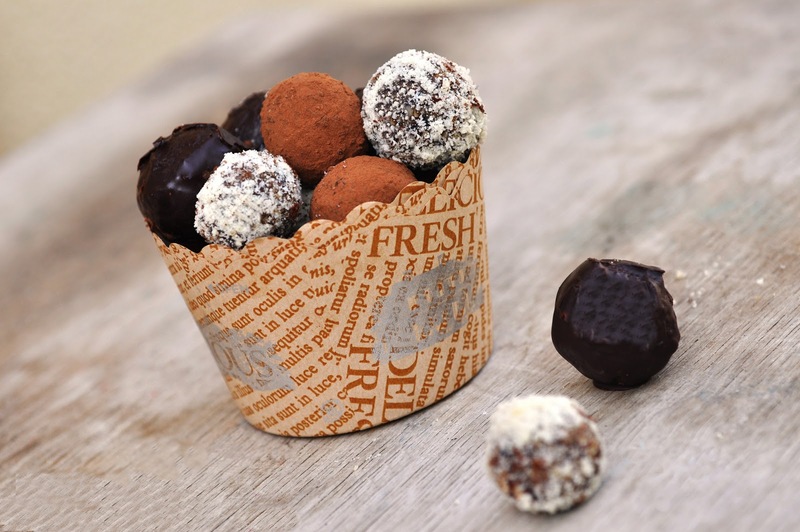 By just using different nuts or dried fruits or another flavoring you end up with a completely different truffle. The Orange-Scented Hazelnut Prune Truffles are a variety of my Walnut Prune Truffles. The idea behind this creation was to make a low GI sweet. Therefore the dates had to go. In fact, I really liked the prunes in the other truffles which made me confident that I could use just them. So I just swapped the nut sort, used more prunes instead of a prune/date combo and and used orange zest instead of cocoa powder for flavoring. As you might have noticed (as this is the second orange-scented recipe in a row), I have a weakness for orange zest. It goes beautifully along the prune flavor, both dark and tart. Simply delicious. And good for you! In a food processor, combine all ingredients. Pulse until mixture is well combined. Form cherry-sized balls out of the mixture. If it does not hold together, add a little water (no more than a teaspoon at a time) and pulse again in the food processor. Roll balls in preferred coating. Place in mini muffin liners. Keep in airtight container in the fridge. Leave at room temperature for 10 minutes before serving. In a double bath, heat chocolate and butter until melted. Stir occasionally until well combined. Take off the heat and let cool a bit. Coat truffles by sticking a toothpick into a truffle. Then roll in chocolate or pour chocolate over the truffle with a spoon. Let become solid on parchment paper before placing in mini muffin liners.